CARMEL, Calif. – September 16, 2016 – Eight members of the Automotive Fine Arts Society (AFAS) earned prestigious awards for their work at the Pebble Beach Concours d’Elegance. Five awards of excellence were presented, along with the annual Art Fitzpatrick Award, the Lincoln Award, and the peer-bestowed Peter Helck Award. Barry Rowe, Jay Koka, Richard Pietruska, Stanley Rose and Tom Fritz received “Equal Awards of Excellence.” The Art Fitzpatrick Award was given to Klaus Wagger. 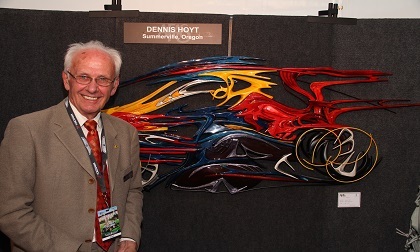 The Lincoln Motor Car Company Award, which was bestowed for the most elegant artwork, was won by Ken Eberts for his striking work including the official 2016 Pebble Beach Concours d’Elegance art. The highest honor presented at the 2016 AFAS exhibit was the prestigious Peter Helck Award. This highly coveted award is the only one based solely on votes by AFAS members. Dennis Hoyt captured it for his 69” x 28”x 6” wood sculpture painting, entitled “RB-13”. AFAS was established in 1983 by a group of artists who are acknowledged as among the best in their field. Members work in many diverse mediums including oil, watercolors, acrylics, wood, gouache, pen & ink, clay and metal. AFAS and its members participate in select shows across the country including the Pebble Beach Concours d´Elegance. Information about AFAS is available at www.autoartgallery.com or by contacting Tyler Weiland at (214) 520-3430 or TWeiland@tprm.com.